Well i dread mealtimes, i always dish Raiden's up first to try and get it cooler, then i end up blowing it until nearly mine is cold. So i jumped at the chance to test out a fabulous Coolfan, they come in four different designs Dixy, Izzy, Axil and Milo. We had Milo for a tester. They come in cartoon charcters with bright and eye catching colours. Raiden thought the fan was actually Milo's bow tie he he. So it was an added extra for him. So the first test was super noodles for some reason these take forever to cool down. I popped the batteries in and put it above he's dinner, Raiden was so impressed that i managed to eat my dinner hot!! Wooo hoo. He kept checking himself to see if it was still hot ( I'm sure he's dinner was probably stone cold ) but he wanted it on, it made the cooling down time became quicker and fun. I didn't realise by blowing on he's food i was transferring bacteria and germs on to it. I was slighty worried about the fan being dangerous but it stops as soon as you touch it. So no cut fingers. Such a simple idea has given me peace of mind, knowing that i can eat my dinner without the moaning and taturms that await, the first thing Raiden does now is grab Milo and sticks it on hes tray. Its had a massive effect on our dinnertimes now. Pop over to the Coolfans website and check out the other three designs. Thanks to everyone that look part. Congrats hun will be in contact soon. Well we got Lexie a new highchair two weeks ago to start her properly on finger foods. Ive given her a few bits now and gain like toast & fruit. So my first task was to try and get Lexie from a bottle to a cup for her juice. Which isn't going too well I've got a collection of 6 cups ones with hard soft sprouts, big/little with and without handles. Ive tryed each one and shes very stubborn too, i tryed the tough love approach with resulted her not drinking any for a day. My next task is going from purred food to lumpy food, I've tryed adding boiled rice in and little lumps to start but she will just spilt them out. She is refusing to eat anything home made apart from mash and will just refuse point blank. She will take most things as in finger foods, shes willing to have a good go. If anyone has any tips they want to share please do. Relief I got the all clear! Well i got the call yesterday i had been waiting for since July! Back in July, i had a lump removed, it had been there for a while, but i was so scared of the outcome that i didn't get it checked. After the other half eventually saying if you don't get it seen to I'm gonna make the appointment myself an drag you up there. After seeing the doctor she said it needs to be removed ASAP, But because i was heavy pregnant to wait until after i had my daughter. She thought it was a fatty lump but said she cant be sure until it gets to the lab and tested. So surely after my Lexie was born i made the appointment & went in for the small operation, it felt like i was in there for about two hours but i wasn't the lump so so big that after it was all out it was the size of a golf ball. I was stitched up and sent of home and told some results would be back in about 8ish weeks. So since then I've had so much worry with stupid things going though my head, wondering how long i would see my kids faces, how ill i would get and planing my own funeral in my head! Jeez i cant believe how stupid I've been, my lesson learnt is never ever leave anything like this for so long, maybe if i got it checked i wouldn't of been in so much pain after as it would of been smaller. After the phone call yesterday it felt like an elephant had been lifted off my shoulders. It wasn't an infection, cancer or nothing serious just a massive fatty lump. I was not the only one worried either, my other half was too. 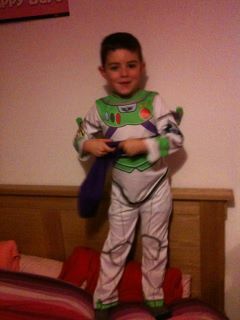 Well my son like most boys and girls likes to dress up, the lovely fancy dress outfitters sent Raiden a gorgeous Buzz Light year costume. They offer a wide range of costumes for every occasion, there is something all year round. They have a massive range of accessories too if you didn't want to go all out in an outfit but still look the part. I was surprised with how quick the outfit came ( the next day) very quick delivery. The outfit is so cute there was an all in one jumpsuit, a purple hood and wings that attach to the back of the jumpsuit with Velcro. The outfit does up with Velcro which is perfect to take it on and off and quick for the toilet moments. 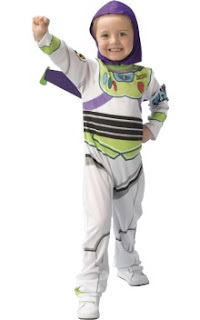 Raiden loved the outfit and was racing around saying to infinity and beyond. The outfit is a mere £13.60 which i think is a great price. The outfit looks like its long lasting and will get lots of use and play. I washed the item and it looked good as new and surprised there was no colour runs too i thought as it was cheap it may run but it didnt. They always do five lots of postage so if you need something in a hurry you can choose the next day delivery. There is always special offers on and lots of deals so your sure to get a bargain. My only fault is there isn't much for babies under one on there site, i would of loved something christmasy for Lexie but there seems a very limited collection. So if your looking for something cheap and cheerful for Christmas here is your place. Fast and friendly service and they also have a no fuss returns policy with a 7 day returns period from the day of delivery. Well that time approaches when our telly's are full off the celebs all night in the aid to changing children's lives. I have a soft spot for anything to do with children and Children in need is always something i give to every year. So what is Children In Need?? They provide grants to projects in the UK which focus on children and young people who are disadvantaged. They are local to people in all corners of the UK and support small and large organisations which empower children and extend their life choices. Raiden's school normally don't do anything for Children in need and i have mentioned in school meeting's they should as its a Worthy cause. Its not much but i tend to give £5 and buy a piece of merchandise. 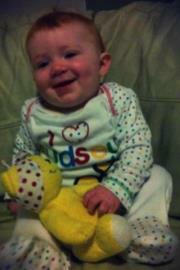 This year i got Lexie a gorgeous Pudsey Bear sleepsuit from Asda. Our First Family Fireworks & Bonfire Night. With it being November 5th, here in England we commemorate the foiling of the attempt led by Guy Fawkes in 1605 to blow up the king and members of Parliament. So we decided to take the kids to there first firework & bonfire party. With a hundred layers on as it was a bit nippy we went to a local pub. Raiden was pretty excited as he was watching them out the window the night before. We didn't go last year and it was tipping it down ( as usual ) but this year it was clear sky's Hurrah! The bonfire was lit with kept us pretty warm and toasty, I was a bit worried as i want sure how Lexie was going to react as normally she isn't to keen on loud noises. So the fireworks started and Raiden was shouting and cheering and Lexie was amazed with the pretty colours, she didn't bat an eyelid. Sea Monkeys Ocean Zoo Competition. Well i thought i would do a competition aimed at the older side, as I'm know for my baby competitions. Raiden keeps hassling for a pet ( hamster) so when i came across some sea monkeys i thought ace, maybe this will throw him off the scent. Raiden loves taking about how things grow and how things change i thought he would enjoy watching something grow right in front of he's eyes. So what are sea monkeys ?? Instant Life! Just add water! Pour water into this special tank using a purifier that removes all the harmful chemicals. Add the Sea Monkey Eggs and these unique laboratory created hybrid brine shrimp seem to hatch instantly! As the weeks go by the Brine Shrimp will grow up to 20mm long, a special growth food is included - simply feed the Sea Monkeys every week - they have a life span of around 1 year but as they breed the aquarium should continue to flourish. Kids will find it fascinating (adults too) and it introduces younger children to the responsibilities of 'looking after' animals. A fun activity book with experiments and instructions is included. The amazing Sea Monkeys - See a miracle of science hatch and grow before your eyes. These water pets are cool - with no mess to clear up. The Ocean Zoo Sea Monkeys set is a perfect way to raise your own Sea Monkey family. This Sea Monkeys set includes a miniature Sea Monkeys tank , with magnifying portals to study your Sea Monkeys in detail. There is also water purifier, instant live Sea Monkeys eggs and growth food with a feeding spoon and a pipette. 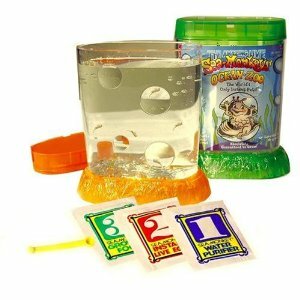 Grow your own pets with Sea Monkeys Ocean Zoo, a great pet for boys with a love for nature. Quite amazing isn't it. So i have one of the ocean Zoo sea monkeys up for grabs. Competition is open to UK & Ireland. Competition will end on the 3rd December at 8pm. I will be in contact very soon. Don't forget to enter the Cuski competition & i will be posted another brand spanking new one tomorrow. Well the lovely Hipp sent little Lexie some yummy food to test out. At the moment Lexie is being pretty fussy with her food she used to love my pureed vegetables and fruit but all she will eat is the dry packet food now or she will take or leave jars too at the moment too. Shes always been a good eater but her teeth are playing up a bit. The first thing i noticed was the thickness you need a spoon to get it out, i had to add a bit of water to the food as Lexie just point blank refused it as it was so thick. I was quite surprised as she ate quite a bit of the turkey & vegetable casserole, about 1/2 a jar. She had no problem with the breakfast and the dessert think she has a bit of a sweet tooth. I love how the range is organic and HIPP have been making baby products for over 50 years. I love the whole vibe on the website too its fantastic there there is always so much going on. As a member you can enjoy all these things for nothing. The second lot we got to test was the pouches, i love how these can just slip in you bag and you can feed your child with just the pouch very handy if your out and about. Lexie took to these quite well and i poped the other half in the fridge for the next day as there pretty big pouches. Totally difeerent texture than the jars to its just like you have pureed them by hand. 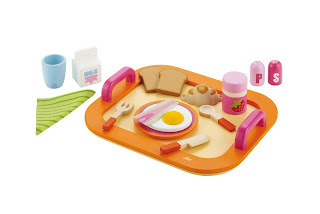 I think these would be perfect to satrt weaning with, lots of different tastes and texture for your little ones. 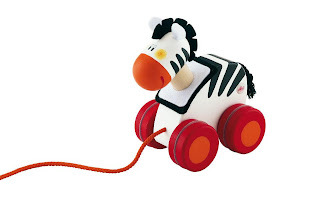 So the fablous Sevi and John Crane Ltd have teamed up to give you fablous and afforable toys. 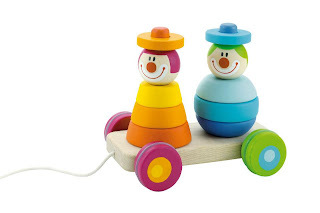 Lots of long lasting wooden toys to keep your children busy for years to come. 1920 – At the beginning of the 1920’s Sevi excited the local market with their small, hand made masterpieces. 1930-1940 – To keep up with a now growing market, new machinery was purchased to support the craftsman’s skills. Automation did not affect the high quality of Sevi but enhanced it. 1950-1960 – The booming economy lead to a new craze of giving children small ‘surprise’ gifts. Inspired by this Sevi continues today to producing not only toys but objects that express the warmth, wonder and friendliness of a child’s world. 1990-2000 – Sevi is acquired by the Trudi Company in 1998, remaining faithful to it founding principles and values; Sevi continues in hand crafted wood, caring for detail and dynamic creativity. Stringent safety testing is applied to all products and Sevi was awarded UNI EN ISO 9001 certification in 2001. 2010 – Sevi chooses John Crane Ltd to distribute to retailers in the UK, and a strong wooden partnership is born. Why not pop over and ‘like’ the John Crane Ltd's Facebook Page to keep up to date with all the John Crane Ltd and Sevi news. You will also see lots of photos of Sevi’s beautiful products.